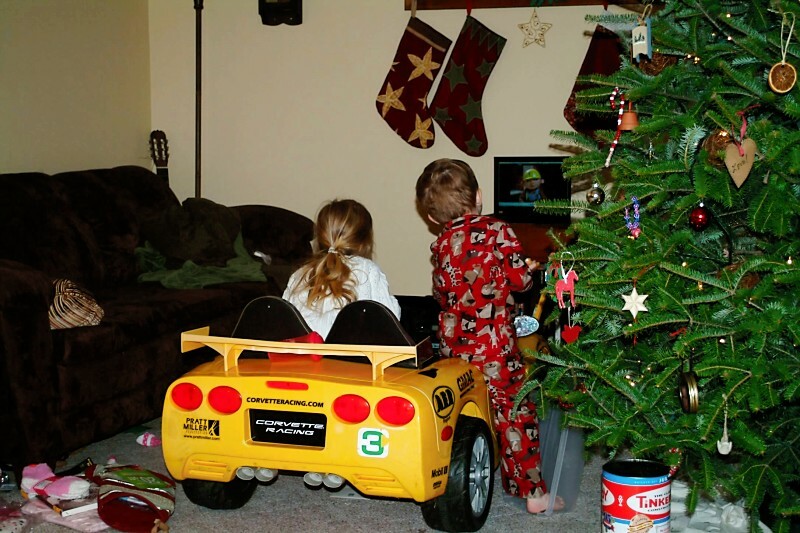 Christmas morning 2010, the Corvette we found for $25 on Craigslist. 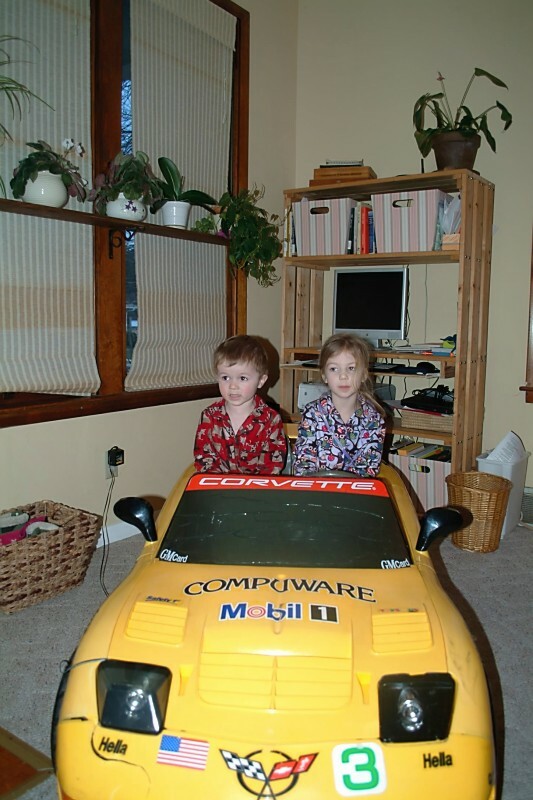 I turned to see my two and four year old children driving their little yellow Corvette through our small, cramped living room. I was standing in the doorway between rooms interviewing a new nanny when I looked up to watch her watching them drive by. We were moving our older two out of daycare and hoping to have a nanny provide care in our home – the news that I was pregnant had finalized the decision. The incredible discovery that we were expecting twins had turned our world on its head the week before so that as I stood there talking, it felt to me that our world was tilting, spinning out of control. In that moment, the picture of our children driving through the house struck me as both absurd and entirely appropriate. It was then that I knew we had fallen or were falling, though toward what I did not know. The incline was steep and the sensation would not end, still has not ended, even now some two years later. What I could not understand then that I do now is that what we were falling into was love, a deeper and wider love than we knew was possible. When I started dating the man who would become my husband we would sit on opposite sides of the college cafeteria with our different groups of friends and make googly eyes at each other from across the room. Whenever our eyes met there was a spark of electricity that spanned the distance and threatened to throw us off of our chairs if we didn’t glance away with speed. Later, when he studied in Oregon for a semester and I traveled out to visit, we spent an evening in Portland exploring and all I remember is sitting together on a bench in the midst of the city. I looked into his eyes, two deep and gentle brown pools and felt myself falling, head-long, heart over heels. When my daughter, my oldest, was born after months of waiting and reading, planning and anticipation, they placed her in my arms and I looked into those small dark eyes and felt a sudden and surprising moment of recognition. It was an aha moment, a coming home and we sank into each other like two lost souls, like two lovers clinging as we plunged into life together. I fell hard, as I have for every baby since. Just recently, I was interviewing yet another babysitter and the moment she walked in the door, my four year old pulled her into the hallway to see our new climbing wall. I felt the same old sensation, the realization that we had fallen, are falling still, head-long into our love for these lives that have sprung up among us. We are off-kilter, leaning hard into love and our home and our hearts are showing the expansion, the wear-and-tear of it all. Love, my friends, is a falling, floundering thing. To love another, to be in and for love, is to consent to live continually off-balance. Love is a leaning, plunging leap, a heart-pounding lunge that leaves your stomach in your throat and the only danger is that we would come to prefer the safety of solid ground over this sensation of continual plummet. To me, this is the only way to explain God coming to live among us, God looking, leaning down toward humanity. God so loved the world that he leapt and fell in among us and in his falling for us he freed us from the fall, for the fall, and the taste is born in us for love – for leaping, falling, floundering, foolish love. Yes, I guess that's why they mean when they say having kids changes you, but it's so hard to understand before it happens! thanks for stopping by! Thanks, Brenna. The climbing wall's not too exciting, we built it more for our daughter than the boys, it's in a tiny hallway, so there isn't much room for falling!